What a fantastic start we have had to school life with the children settling into Mead really well. 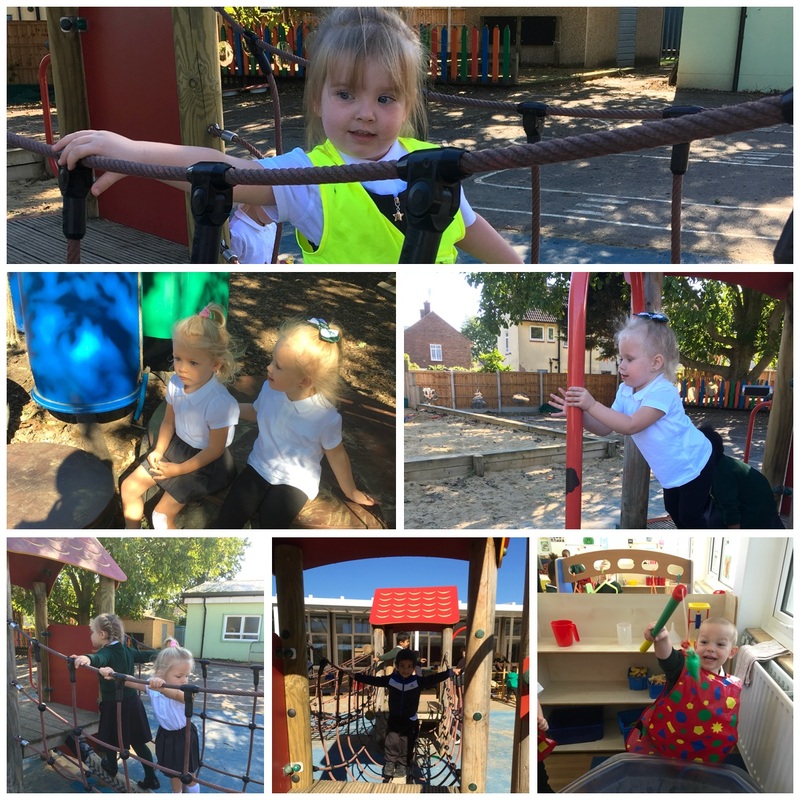 All children managed brilliantly with their longer days and despite lunchtime being challenging for a few of the children by the end of the week they were enjoying their lunchtimes together. As a reminder the school day begins at 8.30 and for safety reasons the gates need to be shut by 8.55am. In the mornings the children need to walk through the main gate and enter through the Reception area doors. At 3.00pm Gate 3 is also open for parents and the children will be released through the Reception area doors. Please note we are asking parents not to bring buggies into the corridors as they become overcrowded at peak times and pose a health and safety risk. Please be assured a member of staff will be on hand to provide assistance in looking after buggies and little ones in the morning. Thank you to everybody who has left their buggies this week. 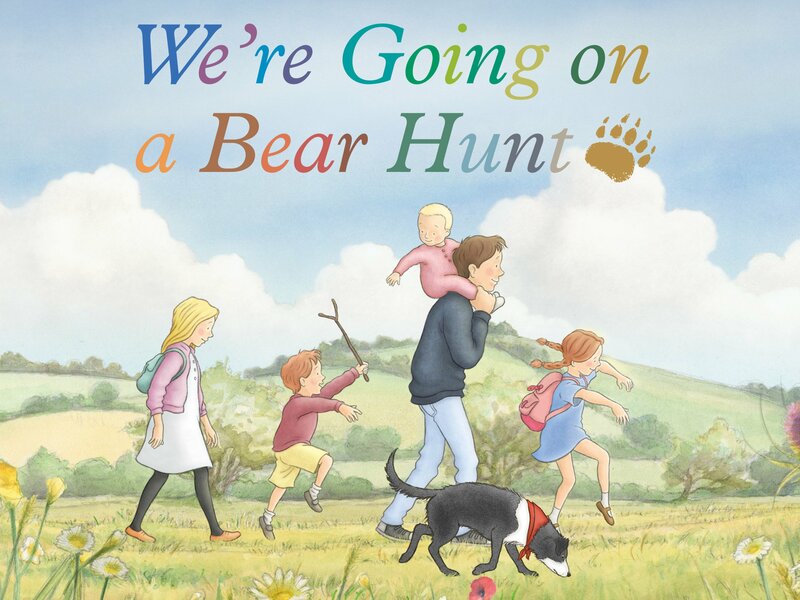 We will continue our topic “All about me” by reading the story `We are going on a bear hunt` by Michael Rosen.The children will be reading the story and acting out each stage in our lovely outside environment.The children will get to make edible bears and do some bear arts and crafts. If you have not yet returned your child’s ‘all about me’ sheet could you please return to their class teachers this week . The children will be beginning our phonics programme Read,write inc this week by learning the sounds m,a,s,d.The children will bring some practise formation sheets home at the weekend. For more information on how we run this programme please attend the phonics workshop on Wednesday at 9.00am. We will also be starting our Maths programme Ten Town this week. The programme teaches number formation,ordering,patterns ,measuring in a very animated way. So do not be suprised if you find yourself singing the songs by the end of the week! Your child will continue to bring home a reading book (which is changed weekly) and a set of sight words this week. The expectation is your child reads at least 3 times or more each week. As we are promoting a love of reading we encourage your child to read a range of books and is not limited to the one we send home with them. On Wednesdays we have our weekly P.E session.Please ensure your child has a P.E kit in school as we have started changing the children for this session.As you can imagine this is currently taking quite a while so all you can do to help your child be independent in dressing is greatly appreciated. The Learning Federation parents association are running a firework night on Friday 2nd November. PLEASE NAME all items of clothing. This will help when returning lost items, particularly jumpers and cardigans with the right child. If your child suffers with asthma please ensure their pump is in school and you have completed the relevant paperwork at the main office. 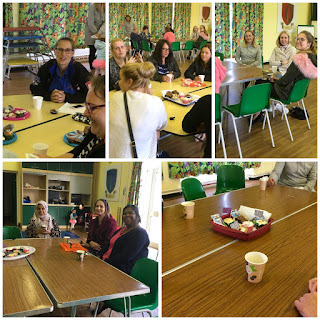 Thank you to all the parents who ateended the Macmillan coffee morning on Friday.It was so nice to see so many of you there and we are so grateful for the kind donations of cakes. We are hoping for a new baby announcement in this section next week. 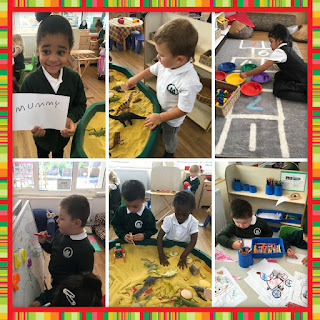 We have been delighted to welcome your children into our Nursery.Working with you to ensure that the children settle well is of upmost importance to us.The children are all individuals. Some will settle confidently, others will find it hard and some will have wobbles along the way. Staff will always tell you how they have been and work with you to ensure the children get the most out of their time at Nursery. Each week we will post a newsletter on facebook and the Mead primary school blog page.This will serve as a reminder for events that are coming up and tell you the activities that we plan to cover that week in Nursery. This week the children are learning routines,getting to know their friends and making the most of their lovely enhanced Nursery classrooms.We will begin to work with the children on some starting Nursery activities and take part in a hall P,E session. Each day we will have a short Circle Time and a story time. The children will also sing songs and Nursery rhymes. PLEASE NAME all items of clothing. This will help when returning lost items, particularly jumpers and cardigans . Please ensure you have told Nursery staff of any medical conditions or food allergies. Please let us know if you have any news you would like to share in this section.We love to share good news so just let us know. Wow ,what a busy place the Nursery has been this week. 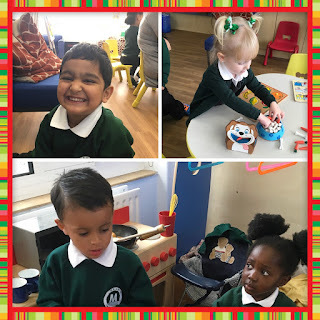 Lots of smiles and a few tears from both children and adults as we begin the partnership of working with you to give your child the best Nursery education you could wish for. So many of the children have embraced the learning opportunities whilst others have looked on a little more cautiously. 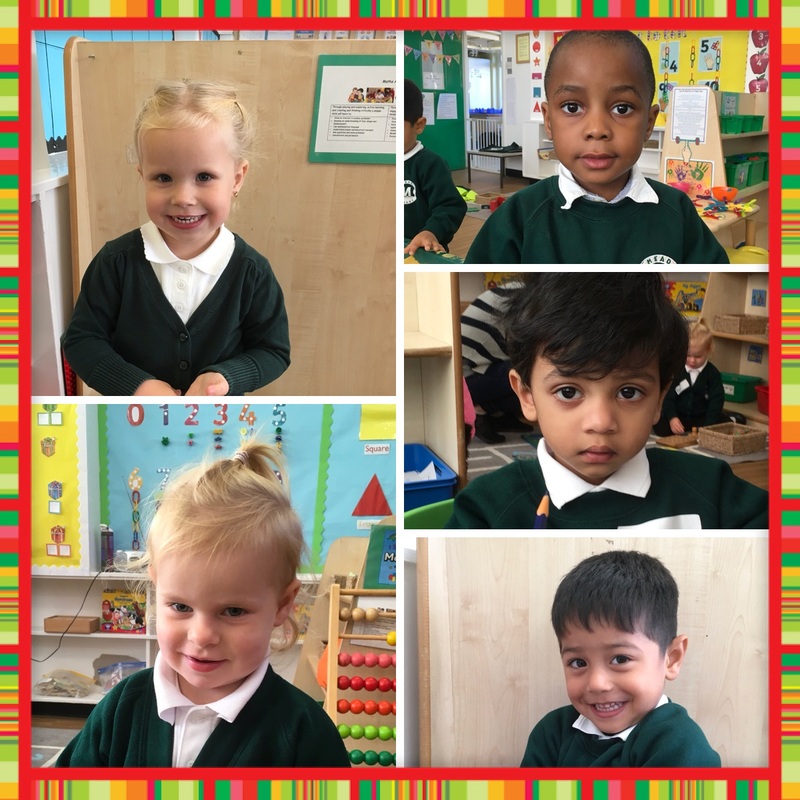 We are delighted to have your children and we look forward to spending a wonderful year seeing your children flourish. The children from Palau Class had a wonderful afternoon at the farm today. 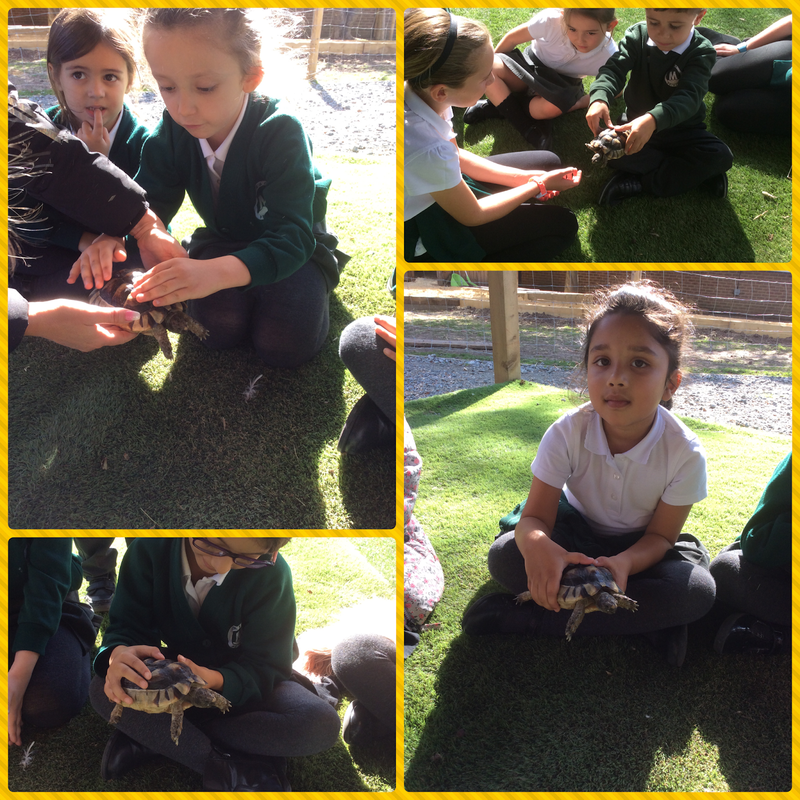 This was an ideal chance for them to get up close with the animals they had been learning about in science lessons recently. Firstly they were introduced to the tortoises: Jenga, Ant and Dec. The children had the opportunity to stroke or hold their new friends. Mrs Hockley talked to the children about tortoises and they learnt some facts about them. Zachary knew that they eat plants and found out the word for plant eaters is herbivores. "I know that tortoises are reptiles." offered Katherine. After their encounter with the tortoises the children met the other animals on the farm. The farm prefects did a great job of taking the children round the farm and telling them about the animals. The children were able to groom the goats, Paige, Blue and Bertie, which both parties loved. They also met the ducks, chickens and rabbits as well as Mr Darcy the donkey, Bobby the horse and Betsy the pony. "I liked the rabbits the best." exclaimed Eva. To finish the afternoon Mrs Hockley read the Aesop's fable The Tortoise and the Hare which the children listened to intently. The children were surprised that it was, in fact, the slow and steady tortoise that won the race. Palau Class can't wait to visit the farm again. Year 4 had a fantastic morning learning about what life was like as a Roman Legionary serving in England. They also were able to take part in some drama, acting out scenes from the Roman times. 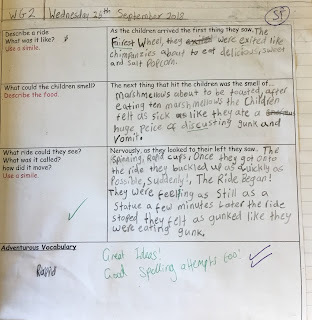 This week in Literacy, the children in Year Four have been focussing on using speech and writing a setting description using their senses and similes. Jacob in Italy class, Anya in Greece class and Ameila in Germany class have all produced some excellent work. This week's Star Writer in Germany Class is Amelia, who has successfully planned her beginning paragraph for her dilemma story using creative similes. Well Done! This week's Star Writer in Greece Class is Anya who has accurately used her inverted commas to show when the character's in our unit are speaking. Well Done! The following pupils have read 10 books and receive bookmarks for their efforts, Bella Leigh in New Zealand, Joshua in Australia, Vansh, Francesca and Kahus in Madagascar, Daisy, Sofia, Ella, Kajus and Tommy C. in Madagascar. Vansh in Madagascar has achieved a bronze reading award for reading 25 books. Well done to Tehzeeb in New Zealand, Linh, Michelle, Roberto and Daniel W in Australia, Billy in Madagascar, Alex in Kenya, Daniela in N.Ireland and Lily in U.S.A who have presented their work beautifully; They have shown pride in their work and taken care with their handwriting and number formation. A Silver Tracker certificate is awarded to George in Scotland Well done to him! Milana in N.Ireland receives a Gold Tracker certificate in recognition of the fantastic effort she has made in learning. Nicole and Lena in N.Ireland, Sophiat and Aminata in Germany, Havin and Reinaldas in Greece, Hollie and Sophie A and Eshaan in Chile have been working hard at home and extending their knowledge through their learning challenge work. Jaion and Rose in New Zealand and Charlize in Mexico receive a certificate for reciprocity and Pritika and Ryan in Canada for reflectiveness. Well done to Tommy in Australia, Ruby in Madagascar, Charlotte in Egypt, Carter in Kenya, Louisa in Wales and Tobey in Mexico who receive certificates for resilience and Shomari in Wales who has shown he can be very resourceful in school. Thank you to everybody who attended our Macmillan coffee morning. 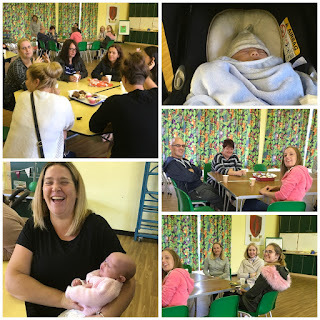 It was lovely to see so many of you supporting this fantastic cause and getting to know other parents/grandparents .So many of our parents said how much they enjoyed it and would like these opportunities regularly. What talent we have amongst our families! We will share the total with you in the newsletter as we know we still have some donations to come in. Thank you our raffle made 33pounds. All of our reception and nursery children are now in school and have settled brilliantly. We are thrilled that they are part of our school community and we hope that pupils and their families feel at home here at Mead already. 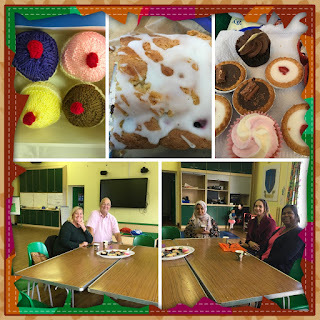 A massive thank you to parents of our Reception pupils for attending the Macmillan coffee morning and for your contribution of cakes and donations for such a worthy cause. Please be reminded that for security reasons parents/carers are not allowed in the school building without first reporting to reception. I am concerned that a few parents have tried to come through the pupil doors in the morning to speak to staff (when they are in class working with children). We are happy to pass messages on and Teachers do come out with the children at the end of the day and are happy to talk to you then. Alternatively you can phone and make an appointment for a meeting. Tuesday 2nd October- In the morning Scotland class will attend a pizza workshop at MOD pizza in Romford. Wednesday 3rd October -Reception parents are invited into school for a stay and read session from 8:30-9;00. This is followed by a reception phonics meeting for parents in our KS1 hall from 9:00-9:30. N.Ireland class’ turn to attend a pizza workshop at MOD pizza in Romford. Between 10:00 and 10:30 Mrs Pidgeon will be showing potential parents around our reception area and during the afternoon our Year 1 Spinebreakers and some of our Year 2 Spinebreakers will be visiting Hilldene Library. Thursday 4th October-CENSUS DAY. It is helpful if all pupils opt for a school dinner today as our funding for next year is determined by the uptake of school dinners. Finally Wales class’ turn to attend a pizza workshop at MOD pizza in Romford. Some of our year 6 pupils will be cycling with Phil, while our year 2 Spinebreakers will be going to Waterstones in Romford. The Freshwater Theatre company are in school leading a drama workshop for our year 2 pupils and our football team will be playing Brookside at Mead after school. Wednesday 19th December -Last day of the Autumn Term. The Learning Federation Parents’ Association are once again busy planning this year’s firework display which will take place on Friday 2nd November 2018 at Broadford Primary School, 5.30pm-8.30pm. Last year we welcomed over 1200 guests and were overwhelmed at the positive feedback from parents and visitors - we sold out of tickets in advance. There will be live music featuring Charlie Dillon from ITV’s The Voice Kids, trapeze artists, a DJ, the Slime Tub Zone, BBQ, firework crafting zone, UV face painting and much, much more. It’s important for us to ensure members of the school community are given first preference and a discount on tickets. Early Bird discount tickets​ are available until Friday 5th October 2018​ by completing the letter/ticket application form which was sent home to all parents last week. If you need another copy of the letter/form please contact the school office or email romfordfireworks@mail.com. For more information see the event website www.romfordfireworks.weebly.com. Week beginning Monday 1st October is week 3 on the Havering catering services menu. All meals are served with unlimited salad and vegetables and cost £2.20. Meals are free to our KS1/EYFS pupils. Please be reminded to top up your child’s catering account as we cannot provide dinners for pupils whose accounts exceed a debt of £10. Well done to Mexico class who had the highest attendance in Y5&6 at 96.3% . Congratulations to N.Ireland who had the highest attendance in LKS2 and overall at 100%. They have earned themselves a cupcake party for their effort. New Zealand had the highest attendance in KS1 at 97.4%. Well done to them!. The overall attendance was disappointing at 94.6% below that of previous weeks and below our target! Imaginations were freely expressed in the woods yesterday. Mud kitchen creations took place, dens were built, birds were spotted and treasures found. The children supported each other to ensure all were included as they found mini beasts, climbed trees and described the forest layers to each other. A busy time was had by all. 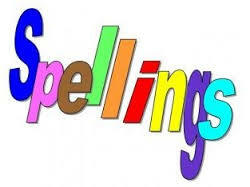 Here are the spellings for Year 4 this week. The children will be tested on these spellings on Friday 5th October 2018. We would like to remind all our Nursery parents and Reception parents that we will be holding a Macmillan coffee morning on Friday 28th September in the KS1 hall. This will be a good opportunity for you to get to know other parents while supporting a really good cause. 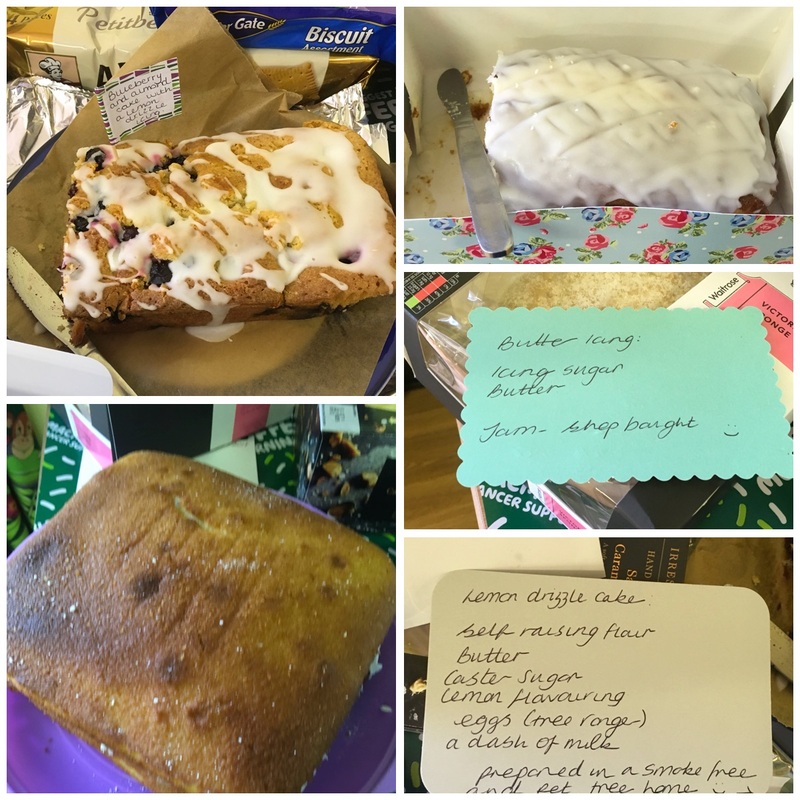 The coffee morning will run from drop off time to 10.00 and we would be grateful for a small donation .All donations will be sent to Macmillan to support the wonderful work that Macmillan nurses do in the community. We would be really grateful for some donations of cakes or biscuits. Please send them in as soon as possible. 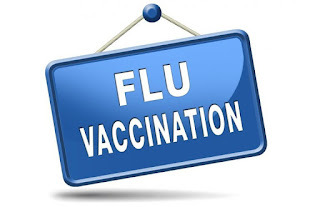 A little reminder to please complete and return your child’s flu immunisation form by this Friday 28th September. 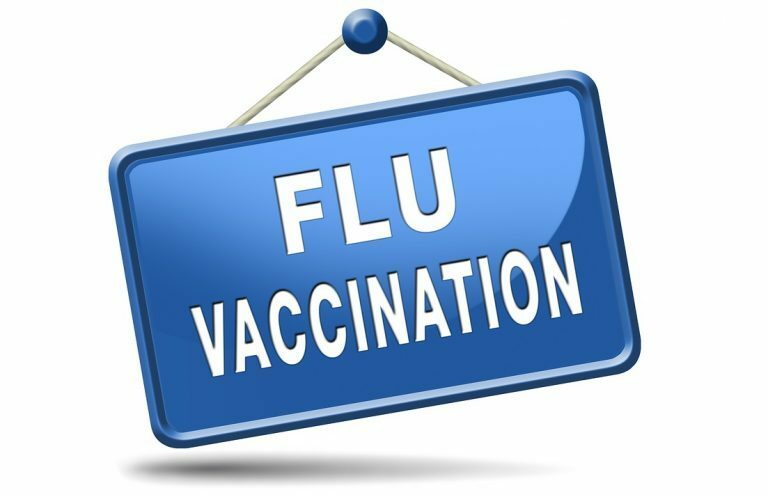 If you do not wish your child to receive the immunisation we still require you to complete the form and return it back to us. If you have not yet returned your child’s health check form, could you please return this to your child’s teacher by Friday. We are looking forward to welcoming all parents on Monday 15th & Tuesday 16th October for parent consultation meetings. You will have the opportunity to meet your child’s new class teacher and find out how they have settled so far this year. The teachers will also explain the expectations for the end of the year for your child. Our year 6 prefects will be in attendance to direct you to our parents survey which we very much hope you will complete. Please complete the attached google form by the end of the school day on Wednesday 3rd October. You will receive your appointment by Monday 8th October. Please find below the spellings for week 2. The spellings below will be tested on Friday 28th September. 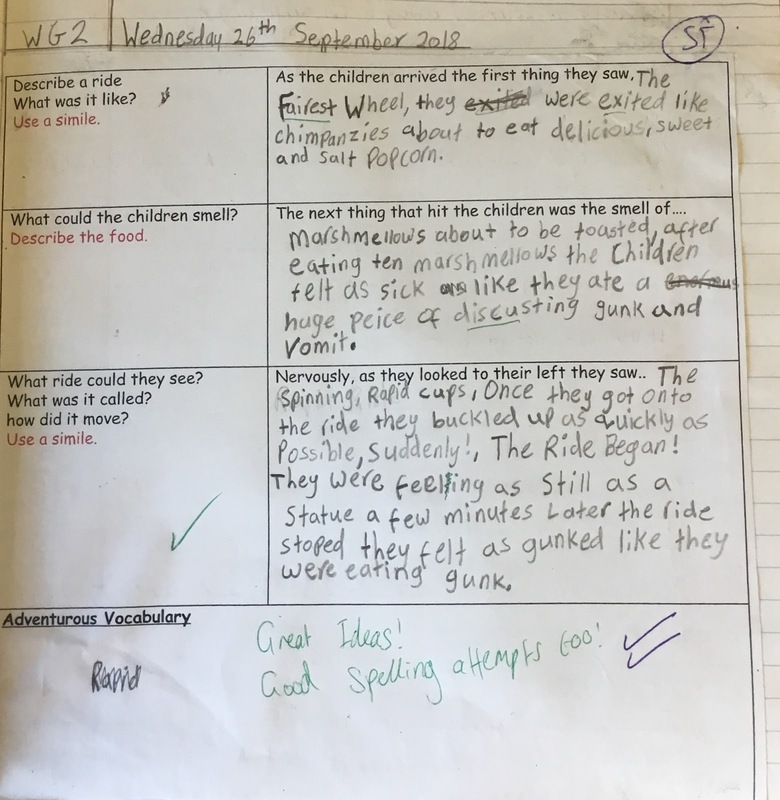 Please ensure that your child practices their spellings for 15 minutes each evening, to help with their progression in the spelling test. Thank you from the year 5 team. Congratulations to Jessie and Kydeigh from Barbados Class who took part in a majorettes competition yesterday. They have been practising hard with their group Phoenix Blue Twirlers and their efforts paid off with both girls doing exceptionally well and winning trophies in their Pom category. Kydeigh took home 2nd place for her group performance and Jessie scooped 3rd for her solo performance. 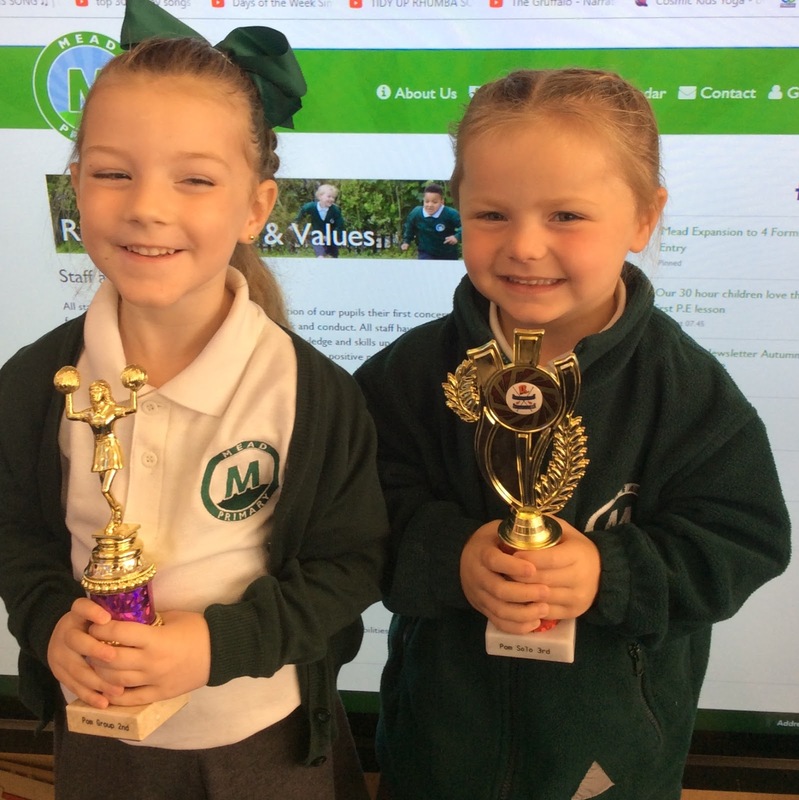 We are very proud of your achievements girls and we know you are busy practising and preparing for your next competitions. We look forward to hearing of your future achievements. Year 2 Fire Station Fun! A new group starts Forest School! Year 3 are amazing architects! Fabulous first week in St Lucia! Year one save the planet! We're having fun in year one!